Get this University Binder Course and we will grant you LIFETIME ACCESS "Ninja Dojo Online" for FREE! WE COVER IT ALL.... from the Old Days training of Ninpo Taijutsu, Ninjutsu, Togakure Teachings, Ten Chi Jin... to Juppo Sessho to the more modern Budo Taijutsu. From the Art of Awareness to Combat Ninjutsu. Why be limited? or forced to a name? Soke's Bujinkan has offered many different teachings from many schools and that training has changed and has evolved as he has. 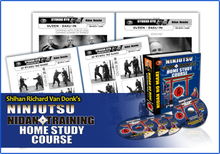 Shihan Richard Van Donk has codified over 35 years of Bujinkan study into a University Course that gives you the full specturm of Hatsumi Bujinkan teachings from the Art of Awareness to Combat Ninjutsu/Budo Taijutsu. We will NEVER offer less!! Our goal is to provide you with the best education possible to take you from Beginner to Master! I am an ALL-IN type of guy when I decide to do something. To me if it is worth doing at all then it needs to be done well and without compromise - especially if I am going to be spending a lot of my time doing it. So I want all the information that I can get on the subject so that I can master it for myself. If you are like me then this course may be for you. The Ninjutsu Masters Course is the result of me going ALL-IN for over 30 years to study with my teacher Soke Masaaki Hatsumi in Japan and taking endless notes and massive research to codify his Ninja teachings. These are my study materials and I offer them to you in an ALL IN ONE Package. So here it is….. Everything you need to study to achieve the level of Godan – 5th degree BlackBelt with IBDA. And this includes my Shidoshi Teacher Training Course and some advanced weapons training. It even includes my own personal training notes on the original Shidoshi teachings called the Ten Chi Jin (Heaven, Earth and Man). I want you to have a personal experience with me as part of your training so as a bonus I offer you a $150 discount for a private session with me so that I can fine tune your taijutsu, teach you the inner arts, or help you through a life challenge. You have 2 full years from the date of purchase to take advantage of your bonuses. 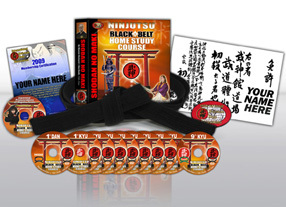 What's Inside the Ninjutsu Master Course Package? BUT WAIT - YOU DON'T PAY THAT!! Your Special Masters Course Package Deal…. You will not pay $3158- You only invest $1997 for at least 25 years of Ninjutsu training material… Less than one trip to Japan. Again, get your Massive Research Library of Bujinkan Ninjutsu and Budo Taijutsu Education taking you from Beginner to Godan (5th Degree BlackBelt) plus the Shidoshi Teacher Training for less than $190 a year prepaid! You save over $1000. It is a knock out deal plus you get the every growing Complete ONLINE VERSION in addition to the hard copy - Best of both Worlds (recommended for Instructors) Saving 30% and you have a University study of NINJUTSU/BUDO TAIJUSTU at your finger tips at any time you want it. I love these arts that I have dedicate my life to. I worked very hard to create this body of knowledge for you. I and others know that what is inside this body of knowledge is life changing. I have to somehow let you know what a wonderful opportunity this is too. And maybe this opportunity is exactly the one you've been looking for and maybe it is not but either way I thank you for checking it out. I think, I mean I really think, that this is a GREAT OFFER. One that I hope you cannot refuse. I understand that this is a big commitment and it is not for everyone. But it may be for you. In fact you may just want to jump on it and wrestle it to the ground. That's how I am and I know there are many others like me who want nothing less than the Ninjutsu Masters Course. Our Ninjutsu BlackBelt Home Study Distance Learning Course is the world's Authentic Original Ninjutsu Training Course - Many of the world's Ninjutsu Masters started with this very course or added it to their studies - several have even tried to make their own. But they do not come close to having the complete Ninjutsu system that we do. If you are like me and you are going to invest your time in learning something like this you would rather be a member of an authentic Japan Certified system that has a complete Ninjutsu Masters Course like the (IBDA) International Bujinkan Dojo Association does. Don't just believe me - check it out yourself! IBDA teachings offer you a lifetime of study in a step-by-step EXCITING PROGRESSION OF LEARNING. The Ninjutsu training starts here with your path to BlackBelt. Black Belt Course into one EASY TO USE binder package. Dvds, Audios and step by step photos for all the techniques Training manual can be taken anywhere you go. Learn the Master concepts and principles of budo taijutsu. Learn the best ways to enhance your training from the insights of 10 instructors who have all trained in Japan. 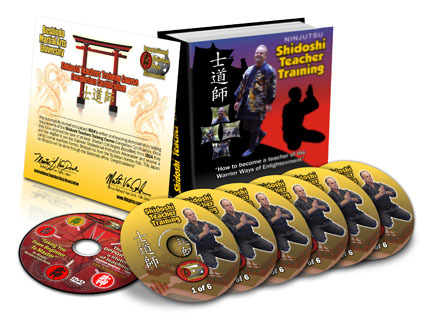 13 (Thirteen) Audio cd's - Shidoshi Richard Van Donk recorded the entire Instruction Manual PLUS more on audio! Shidoshi-Ho opportunity with IBDA - Become an instructor of Ninjutsu registered in Japan. Learn the Gyokko Ryu Wazas Step-by-Step by video lessons and a picture manual! Learn the Kukishinden Ryu Hanbo wazas Step-by-Step! Learn the Kanji Strokes for all the Gyokko Ryu waza! Learn the Shinden Fudo Ryu Wazas Step-by-Step by video lessons and a picture manual! Learn the Takagi Yoshin Ryu wazas Step-by-Step by video lessons and a picture manual! Sword, Hanbo, Tanto, Kusari Fundo, Shuriken, Teppan, Rokushaku Bo, Naginata, Jutte, Shuko, Kyoketsu Shoge, Yari, Hand Gun and Kunai. Plus Certification and a Patch for your Gi! STUDY ANYWHERE - STUDY ANYTIME!! YOURS FOR ONLY $1997- for at least 25 years of Ninjutsu training material… Less than one trip to Japan. A great investment! Get this University Course and we will give you LIFETIME ACCESS "Ninja Dojo Online" for FREE! Limited Time Special - Special Masters Course Package Deal…. Only $1797- Just Get it Now as I cannot guarantee this Special $1797 price will be here when you come back. Going all in and guaranteed to win! This course is for those that want to get the full Bujinkan experience. This course has all the materials you could possibly need to be set up for success in the IBDA. From KuKyu to Godan, you will have every single technique and perfect practices needed to pass your tests and, more importantly, learn about yourself. I couldn't be happier with this purchase and the staff at Ninjutsu.com have been extremely helpful, knowledgeable, and courteous. This organization has been true to their word and have certainly transformed my life for the better. Highly recommended course! Highly recommended Bujinkan family! The ninjutsu masters course is awesome. I can't thank you guys enough. This is the way to go if you want a lifetime of training in one complete course. I had purchased the BB course when it was on tape. While I loved it I had problems with training partners, etc. When I decided to come back to the IBDA I went "All in" as Shidoshi says. So much information. BB course, teacher course, Budo Taijutsu, and the material takes you through 4th dan...actually 5th.If you can do it this way I highly recommend it. Saves you money, nine year membership. This is the way to go!!! Click the button below to add the NINJUTSU MASTERS COURSE to your wish list.